This section consists of a narrative history of Safeway. It is currently being rewritten and new pages are being added as they are completed. There is also the original (and somewhat incomplete and inaccurate) version of the history from the early years of this site. It will be removed when the new pages are complete. Photos and other material will also be added, so as long as this notice appears here, this section will be subject to editing and updating. Watch for changes! In the beginning, there were Sam Seelig and Marion Skaggs, two somewhat different grocers in very different parts of the country. 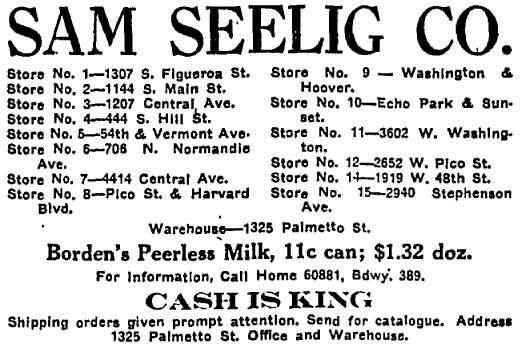 In 1911, Seelig opened his first store at 1307 S. Figueroa Street in Los Angeles. Five years later, Seelig had fifteen stores in the city, mostly south of downtown, and a warehouse on Palmetto Street. The chain had grown to over one hundred stores by 1922, and Seelig had established a real estate concern to handle the growing company’s needs. The rapid growth proved problematic for Seelig over the next three years, however, and in 1925, control of the company (and it’s 270 stores) passed to its distributor and largest creditor, W.R.H. Weldon. On 15 March 1925, the Los Angeles Times noted the change in management and announced that the company would now be known as The Safeway Stores, Incorporated and that Seelig had “withdrawn to follow other pursuits.” In Wall Street to Main Street, Edwin J. Perkins states that Seelig stayed with the new company for some time to manage its retail operations, but that Weldon was “extremely distrustful” of him and was anxious to sell off the company and return exclusively to wholesaling. Marion B. Skaggs followed a somewhat less urban path, opening his first grocery in American Falls, Idaho, in 1915. By 1921, he had fifteen stores in the region, all of the operating on a cash-only basis. Skaggs relocated his headquarters to Portland, Oregon, in the early 1920s while simultaneously entering the wholesale grocery business. By 1925, he had merged his chain with one operated by another Skaggs family member, and the resulting chain boasted over three hundred branches in Oregon, Montana, Idaho, Nevada, and Northern California. In 1926, an investment group organized by Merrill, Lynch, and Co., purchased 80% of the outstanding stock on Safeway Stores for $3.5 million, and Charles Merrill began looking for a merger partner and possible CEO for his new grocery chain. He found both in Marion Skaggs. The merger of Skaggs Cash Stores (primarily in Utah, Nevada, Nebraska, Wyoming, and the San Francisco and Sacramento areas of California), Skaggs United Stores (primarily in Oregon, Washington, Montana, Idaho, Colorado, and California’s San Joaquin Valley), and Safeway Stores (primarily in Southern California and the Bakersfield area) was announced on 11 November, 1926. Skaggs surrendered control of his company for $1.5 million in cash plus 30,000 shares of the new company’s stock. He was also named CEO, and Merrill agreed that he would be unhindered by a board of directors for the first five years. 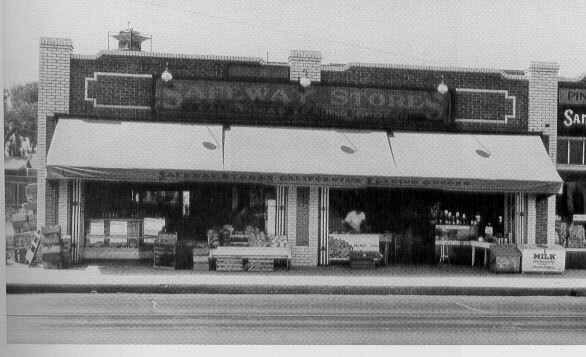 The former Skaggs stores were to be operated for a time under the Skaggs-Safeway name, while the southern stores remained simply Safeway. At the time of the merger, the new chain totaled 750 grocery stores, 114 meat markets, and 5 bakeries, with annual gross sales approaching $50 million. Oakland, California, was chosen as the headquarters for the northern stores and ultimately for the entire chain. Within the next few years, additional mergers and acquisitions came at a rapid pace. Chains absorbed between 1926 and 1928 included Bird (Kansas City), Knoblock and Eastern Stores (Baltimore), Chaffee (Los Angeles), Sanitary (Washington and Richmond), Sun (Tulsa), Newway (El Paso), Pay ‘n Takit (a chain operated by another branch of the Skaggs family in numerous western states), and MacDonald (Canada). 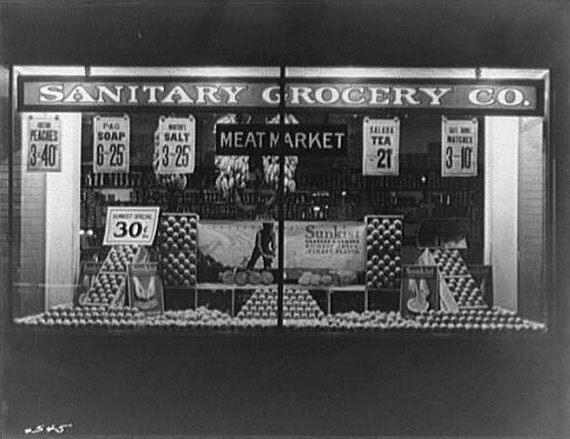 Sanitary itself had recently acquired the Washington area Piggly Wiggly stores, and Safeway followed suit by acquiring Piggly Wiggly Pacific (based in Northern California) in November, 1928. At this point, Marion Skaggs “emphatically denied” that the company had planned to acquire Los Angeles-based Piggly Wiggly Western and stated in the Los Angeles Times that Safeway’s mergers in California were “substantially complete.” Most of these stores would continue to operate under the Piggly Wiggly name for several years. On 22 June 1929, the New York Times reported that Safeway was operating 2394 stores in twenty states plus Canada and the territory of Hawaii, of which 1050 included meat markets, and also noted that the company was considering expansion in Canada through the acquisition of 1000 stores over the next three years. Sales in 1928 topped $100 million, and were projected to double in 1929. The July, 1929, issue of Uno Animo, Safeway’s employee magazine lists a complex divisional and district structure. Early in 1929, Charles Merrill managed to assemble yet another large grocery chain centered on the West Coast. By merging chains owned by Ross McIntyre of Portland and Charles Marr of Spokane, Merrill was able to create a corporate entity that rivaled Safeway to some extent. McIntyre and Marr both wanted to work with Merrill but each was unwilling to assume a subservient role to Marion Skaggs, according to Edwin J. Perkins in Wall Street to Main Street, so the new chain was assembled under the assumption that it would eventually be merged with Safeway once Skaggs stepped down as CEO. Noteworthy in the creation of MacMarr is that it was orchestrated by Charles Merrill’s new assistant, Lingan Warren. The initial roster of chains merged into the new MacMarr corporation was announced in the 3 April 1929 Wall Street Journal and included McIntryre’s Portland stores, Marr’s (Spokane), Stone’s Cash Stores, Consolidated Stores, Inc., LaGrande Grocery Company, Eagle Stores, Inc., MacLean Brothers, and two Piggly Wiggly chains, one based in Los Angeles and the other in California’s San Joaquin Valley. Charles Merrill had announced late in 1928 that Safeway would not be acquiring Los Angeles-based Piggly Wiggly Western as it had with the Northern California franchisee; in hindsight, it is easy to assume he knew at that point that his new chain would be purchasing the Southern California franchise, giving Merrill Lynch control of virtually all Piggly Wiggly stores west of the Rockies. The day before, the Los Angeles Times had noted that Von’s (the first of two different chains to be established under that name in Southern California by Charles von der Ahe) and E.A. Morrison would also be part of the chain. Other stores merged into the new MacMarr chain in 1929 included Mutual Stores of San Francisco, the Economic Food Company (Fresno), Heller’s (San Diego), Piggly Wiggly Laws (Modesto), Piggly Wiggly Puget Sound (Seattle), Tacoma Piggly Wiggly, Bay Cities Mercantile Company (Los Angeles), Snodgrass Food Company (Colorado), Continental Food Company (Denver), Piggly Wiggly San Francisco, and Coast Piggly Wiggly Co. (California). By 1930, MacMarr was operating more than 1400 stores, including 372 meat markets, in ten western states. Most locations were along streetcar strips in relatively suburban areas, with the developing Outer Mission, Richmond, and Sunset Districts being particular favorites. None had dedicated parking. A significant number appear to be purpose-built single-story structures with a similar architecture, although some stores were located in existing multistory buildings. As the 1920s closed, Safeway was operating twenty-six stores in San Francisco according to the 1930 city directory.